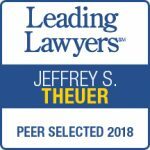 Jeffrey S. Theuer has extensive experience in complex litigation matters, with particular expertise in energy, construction, labor, employment, and business law. He successfully represented a public utility in litigation before the U.S. Court of Federal Claims in Washington D.C. involving the Department of Energy’s breach of its contract to dispose of spent nuclear fuel, which resulted in a settlement in excess of $100 million after 9 years of litigation. He has handled bid protests and licensing issues before federal, state and local government entities. Mr. Theuer has represented large energy companies and utilities in mass multi-jurisdictional contract and tort matters. He regularly assists associations, businesses, non-profits, and self-insured funds with commercial contract and governance issues, and general corporate matters. He regularly reviews and drafts licensing, royalty, and intellectual property agreements, and manages a portfolio of trademarks. Mr. Theuer has been extensively involved in assisting construction associations and contractors in all aspects of their businesses. He has assisted clients in Department of Labor audits and litigation, and in labor disputes before the National Labor Relations Board. Mr. Theuer is also active in the mid-Michigan community. In 2017, he was appointed to the Meridian Township Brownfield Review Authority, and currently serves as its Vice President. He served on the Okemos Public Schools Board of Education from 2004 – 2012 (President, 2007-09), and is a former Member and Chair of the Planning Commission for the City of Portland, Michigan. Mr. Theuer graduated from the University of Kentucky College of Law, where he was Associate Editor of the Kentucky Law Journal, and earned an L.L.M. from George Washington University. He joined the Loomis Law Firm in 1993 after practicing in Baltimore, Maryland. He has been listed in the Best Lawyers in America since 2011 for his expertise in Commercial Litigation and Construction Law, in Michigan Super Lawyers for Construction Law, and Leading Lawyers. Fellow, Michigan State Bar Foundation . Named to Best Lawyers in America (2011 – present). Named as Michigan Super Lawyer (2014 – present). Recognized by Leading Lawyers (2014 – present). Member, Meridian Township Brownfield Review Authority (2017 – present) (Vice President, 2017 – present). Member, Board of Education, Okemos Public Schools, (2004- 2012) (President, 2007-2009). Member and Chair, Planning Commission for City of Portland, Michigan, (1994-1998). Merit Shop Member of the Year, Associated Builders & Contractors – Central Michigan Chapter (2007). Contributing Author, A Contractor’s Guide to Michigan Construction Law, Associated General Contractors (1995, 2004, and 2009 Editions). Author, “Environmental Law,” 2002 The Law Review of Michigan State University – Detroit College of Law, 497. Author, “Aligning Environmental Policy and Bankruptcy Protection: Who Pays For Environmental Liabilities Under the United States Bankruptcy Code?,” 13 Thomas M. Cooley Law Review, 465 (1996). Author, “The Lemon Test and Subjective Intent in Establishment Clause Analysis: The Case For Abandoning the Purpose Prong,” 76 Kentucky Law Journal, 1061(1987-88). Construction Law Lecturer for Construction trade groups, (1996 – present). Construction Law/ Bankruptcy Law Seminar Presenter, Lorman Education Services, (1999 – present). Business Law Lecturer, Lansing Micro Enterprise Institute (1995 – 1998). Contributing Author, Michigan Constructor Magazine. Environmental Compliance Seminar Lecturer (2001). University of Michigan, B.A., (with honors), 1986 .